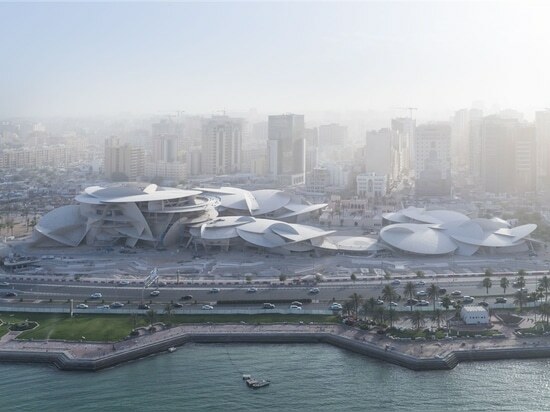 Under the patronage of His Highness Sheikh Tamim bin Hamad bin Khalifa Al Thani, Qatar Museums opens the National Museum of Qatar (NMoQ) to the public on 28 March 2019. 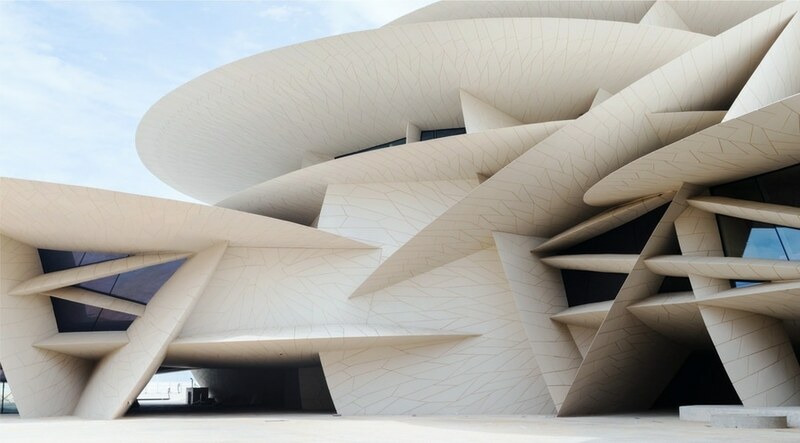 The spectacular 52,000-square-meter (560,000-square-foot) NMoQ embraces as its centerpiece the restored historic Palace of Sheikh Abdullah bin Jassim Al Thani (1880-1957), son of the founder of modern Qatar. 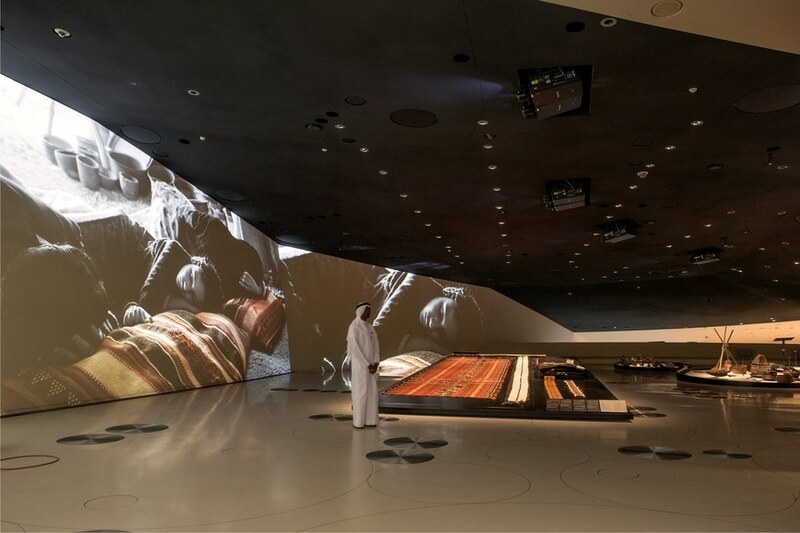 A building that in former times was both the home of the Royal Family and the seat of government, and was subsequently the site of the original National Museum, the historic Palace is now the culminating exhibit in the sweeping succession of gallery experiences. 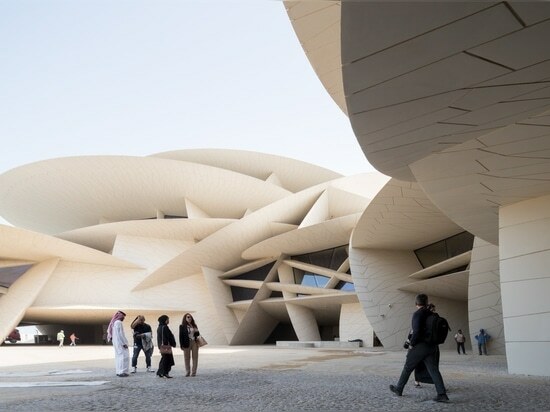 The building design is inspired by a mineral formation commonly found in the deserts of the Gulf region. The ‘desert rose’ is a rock formed when minerals crystallize in the crumbly soil just below the surface of a shallow salt basin. The system of interlocking disks surrounding the historic palace like a necklace looks as if it’s been propagated organically. 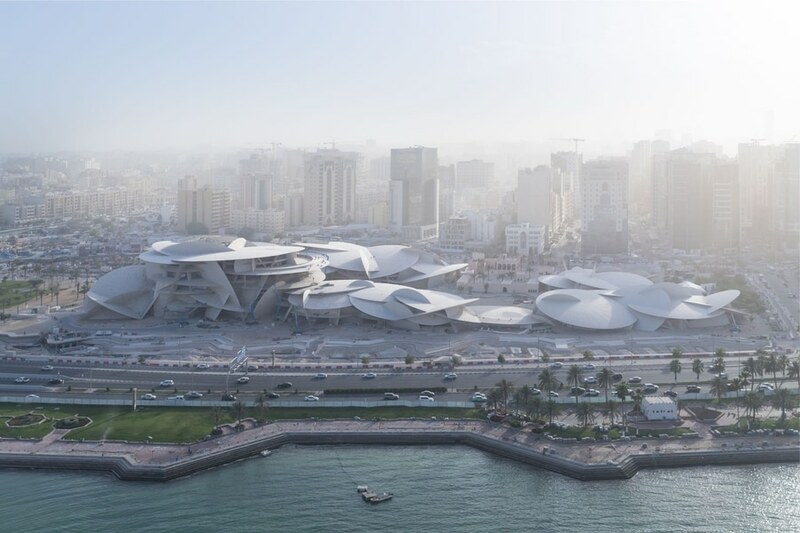 It incorporates exhibition spaces that fan out in an elliptical circuit around a central court, the Baraha, where outdoor cultural events will be staged. The desert-rose form evokes the culture and climate of Qatar. It emerges from the ground and merges with it. 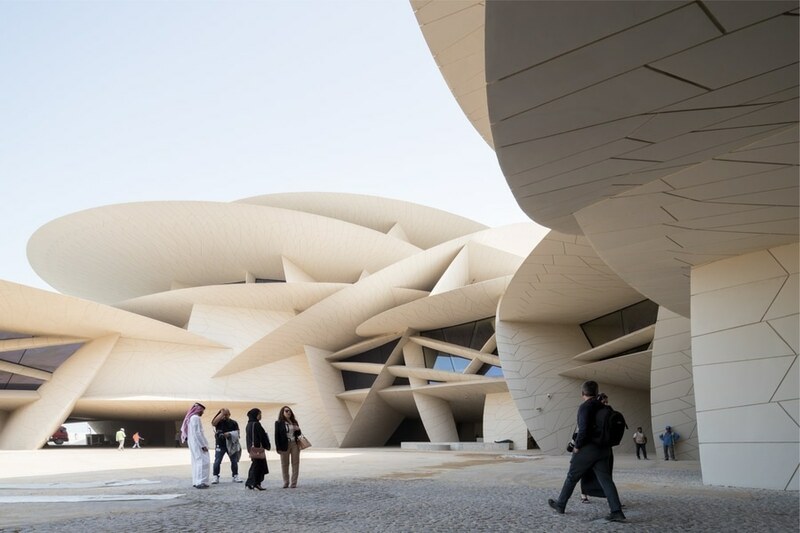 The shadows created by overhanging elements allow visitors to stroll around outside at the same time as protecting the interior from light and heat. The sand-coloured concrete cladding is in harmony with the local environment. 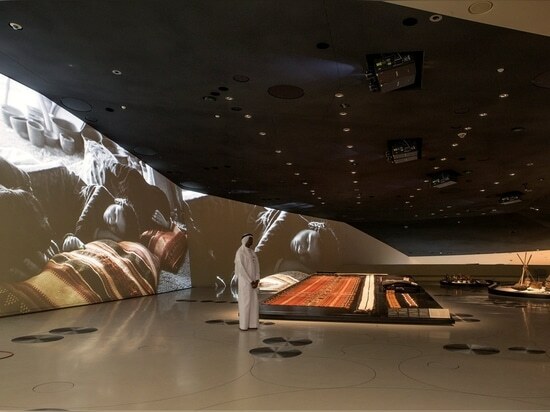 Visitor Experience The museum visit follows an elliptical circuit that gently rises and falls, evoking the natural undulations of the landscape. 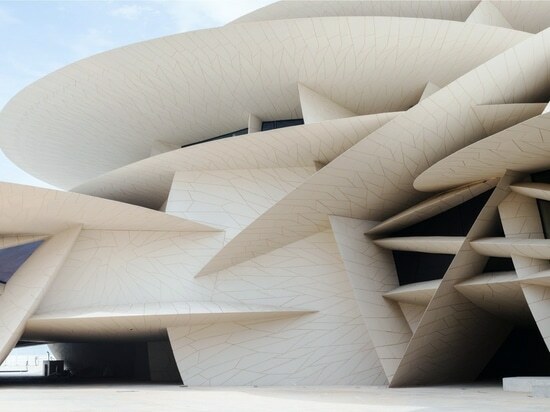 Large openings offer glimpses of the Baraha, the museum’s gardens and Doha Bay. Park The museum is surrounded by a landscaped park that reinterprets Qatari landscapes, with alternating low dunes, flooded crops and gardens inspired by sabkhas and oases. Containing only local plants and trees, the park tells the story of Qatar and how its people lived in and cultivated the harsh environment. It includes a heritage garden of traditional plants and large grassy areas perfect for stretching out on in the evening. A 430-car parking area is seamlessly integrated into the park. The design is geared to the local climate. Cantilevered elements provide areas of passive shade. Buffer zones in the spaces between the disks create thermal mass, reducing cooling loads. The heating and cooling systems used in the building are state-of-the-art. Steel and concrete, the main materials used, are locally sourced and/or made. The landscaped park features only drought-resistant native vegetation. These and other sustainability measures have qualified the NMoQ for a USGBC LEED Gold rating and GSAS 4 Stars. The building is composed of large interlocking disks, spherical in section, and of different diameters and varying curvatures. Some disks are ‘horizontal’ and rest on other disks. The ‘vertical’ disks constitute the building’s support and transfer the loads of the horizontal planes to the base. The building is clad in ultra-high-performance glass fiber-reinforced concrete (UHPC) panels approximately 2m² each, fixed to a steel frame that spans an insulated waterproof superstructure. 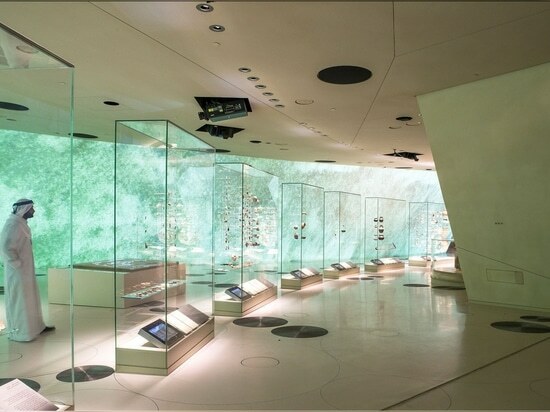 The voids between disks are filled with glass panels, whose frames are recessed into the ceilings, floors and walls, making the panels look frameless. Mullions divide the larger glass walls into units that can easily be manufactured and transported. Discoid visors stop the sun coming in. Like the exterior, the interior is a landscape of interlocking disks. The finishes are neutral and monochromatic. The floors are sand-coloured polished concrete with tiny mineral aggregates. The vertical walls are coated in stuc-pierre, or stone stucco, a traditional gypsum and lime-blended plaster that provides a stone look. Ceilings are covered in a microporous acoustic plaster sprayed on mineral wool. 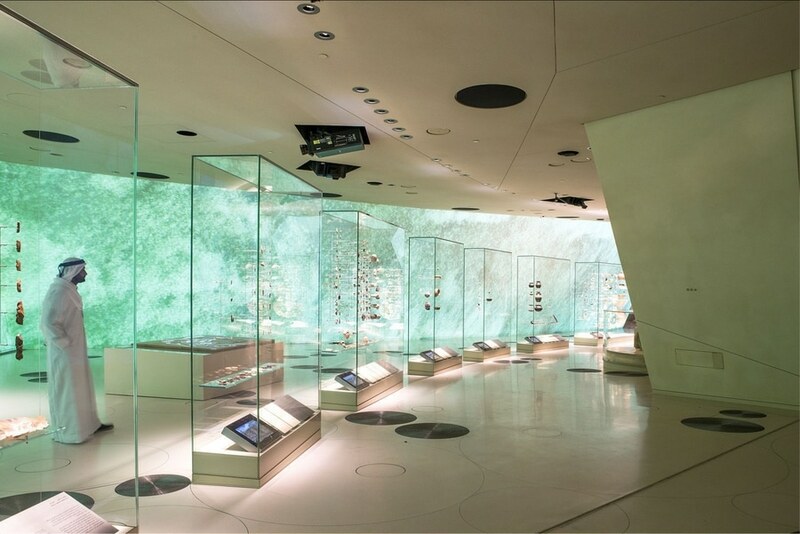 Source by National Museum of Qatar.